Huawei’s Connect 2018 event, which took place in Shanghai, China this past week, firmly focused on artificial intelligence (AI). It was a fitting topic for a fitting city – Shanghai is a destination that you would imagine finding in the not too distant future, with soaring ultra-modern buildings of steel and glass, more than a little reminiscent of Blade Runner. AI meanwhile has been the fascination and focus of science fiction for decades, postulating a ‘someday’ in the future. However, AI is happening now, a fact clearly apparent in the opening keynote address. More importantly, it is a technology that is set to come into its own in the years to come. 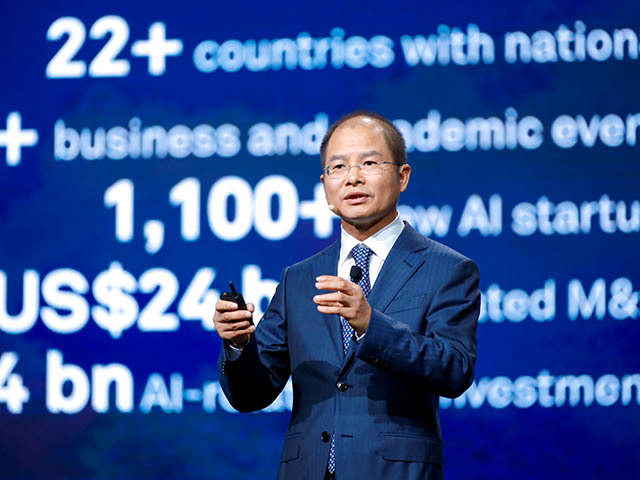 Eric Xu, the chairman of Huawei Technologies, explained that AI will change every organisation, and that change has just begun. However, there are two sides to how this change will be received – for some companies it will offer excitement about the possibilities that AI heralds, and an urge to act by driving AI adoption. For other companies and businesses, it brings anxiety about underperforming AI projects, and concerns about the security of AI applications. Accompanying this will also be uncertainty and confusion about how best to use AI. It is not only businesses who will experience this dichotomy. For individuals, the range may well be between opportunity and despair. This is best illustrated on AI’s impact on jobs, an issue frequently mentioned as a prime concern, and one that Huawei addressed from the outset. According to Xu, the demand for data science related jobs will keep rising in an AI era, while the need for jobs based on routine tasks will fall. It was a sentiment that Kevin Chen, the Enterprise Business President of Huawei Southern Africa later added to, noting that while AI likely will make certain jobs extinct, it will open doors to new opportunities and new roles that have yet to be envisioned. Even as the technology is maturing, AI is not a turnkey development that we can realistically expect to work perfectly from the outset. Rather, Xu explained that successful innovation only happens after several iterations, and thus AI adoption is a journey. “AI is still in its preliminary stages, and we are standing at the entry to having an AI-infused (intelligent) society,” he enthused. That being said, AI can already free us from massive, intelligent, dull work, as well as achieving tasks beyond human capacity. An example given of the latter is that trying to differentiate between copyrighted versus pirated images online would be an onerous task for a human. However, it is a job that could be offloaded to an artificial intelligence application. Another, more pertinent example, is that the average bank clerk can process 30 bank accounts in a day. When using an AI application, that number jumps to 1 400. How pervasive can AI be? Well, picture this. You walk into an airport, and facial recognition is used to determine where you are as, check you in to your flight and unlock access to your gate. In the event of you running late, a Last Call function can locate you within the airport and send personnel to find you so that you may board in time to catch your flight. Amongst the scenarios where the usage of AI was explored, one of the standouts was in transportation, most particularly in vehicles. Audi Executive Vice President of Audi China R&D, Saad Metz pointed out that 90% of accidents happen because drivers are distracted or tired. This, he added, could be largely solved with intelligent connected vehicles. Indeed, one demo in the expo showed how an AI system could guide drivers when to slow down, when their car was drifting, whether they needed to change lanes, and how to adapt to the traffic around them. Beyond that, ultimately, with full autonomous vehicles, users would be to reclaim some personal time spent on driving – which Audi calls the 25th hour in a day – to free them up to do other things that are more meaningful than navigating traffic. As well, there is the issue that a lot of the time a car is parked in a parking lot or garage. Better management of cars - such as paying per use of an autonomous car - could free up space that would otherwise be used for them to be parked while their users are in an office, an issue that Travelport recently alluded to. And then there is the usage of AI for better traffic management. Li Qiang, the chief of technology for the Traffic Police Bureau in Shenzhen, China explained that AI can be used for better law enforcement as well as reducing congestion on the roads. As an example, he elaborated that AI can identify drivers talking on their cellphone while driving in a second, by capturing and analysing their image, as well as those not wearing a seatbelt. Addressing concerns that this may spur fears about being constantly watched by a government agency, Qiang noted that traffic authorities still had the discretion as to which of these offenses they would actively pursue. As well, AI is also being deployed to reduce traffic congestion. Instead of drivers having to wait for the traffic light to change, AI infused traffic lights can count the number of cars at an intersection and change accordingly to ensure the best possible traffic flow. Preliminary results of this have been promising, with Qiang mentioning that they had seen a 17% decrease in waiting times in Shanghai traffic in the past year. “AI is empowering a new era of traffic management,” he enthused. And yet even this was just the tip of the iceberg. There was so much more to AI, what it can do and how it can be used, as well as the intricacies involved in adopting and more fully utilizing the technology. While these will be explored in subsequent articles, Xu’s closing thought was a recommendation as to how AI should be approached. “Instead of asking what AI can be used for, we should be asking the question what problems do we want AI to help us solve?” he concluded.